We all try to pinch pennies whenever possible. But when it comes to finding a quality roofer, cost shouldn’t necessarily be the deciding factor. The reality is that you want to get the maximum lifespan out of your new roof. With that in mind, quality materials and the installation crew are critical. In this blog post, we’ll list our top tips for choosing the best roofer in your area. Ensure that shingles are matched – As explained in this guide from Angie’s List, roofers who don’t use a consistent manufacturer can end up applying mismatched shingles if purchasing from more than one supplier. Simply put, the look of mismatched shingles is tacky and unattractive. By choosing a roofing contractor who consistently partners with the same supplies dealer, this won’t be an issue to worry about. Confirm that the old layer of shingles will be removed – It’s best practice to remove the existing layer of shingles prior to installing the new one. This enables the roof installation crew to inspect for fragile areas and potential damage. Plus, having multiple layers of shingles can actually harm your home’s walls and roof structure. Don’t let them forget about the attic – Many homeowners don’t realize that a roof is made up of many components. Therefore, proper attic ventilation is necessary. Without it, the shingles can wear out sooner, your insulation can be ruined, and your energy costs can increase in a hurry. Communicate about the roofing permit – Did you know that you, the homeowner, are held liable for failure to obtain a roofing permit? Should your roofing contractor drop the ball in this regard, there could be fines, forced removal of the new roof, or your insurance company refusing to insure the roof as consequences. Ask about insurance – This is a big one. If the contractor doesn’t have insurance and a worker is injured during your project, you’re the one responsible. It doesn’t seem fair, but unfortunately, many shady roofing companies skate by without being properly insured. When you decide on a roof installation team, be sure to ask for documentation of their insurance policy. 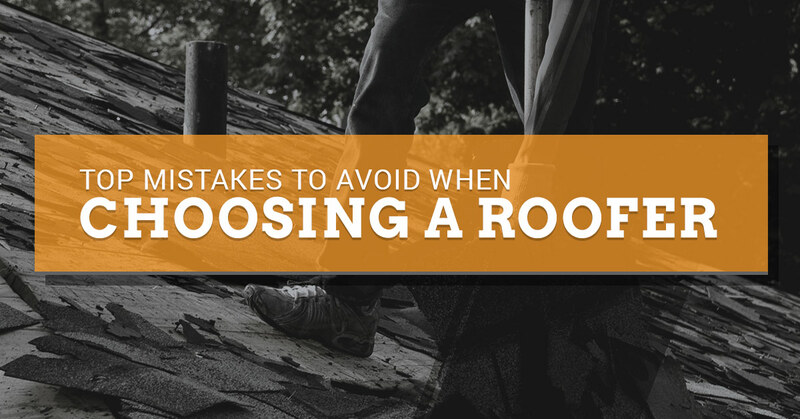 Now that you know the mistakes to avoid in choosing a roofer, let’s focus on what we do specifically. At Sands Roofing and Construction in Lexington, homeowners rely on us for the highest quality of work, as well as transparency and communication throughout the process. Our residential roofing services are second to none. Each of the installers on staff is licensed, bonded, and insured. We also maintain great relationships with all major insurers, so there’s no need to concern yourself with recouping high costs. Have you ever had someone come to your door offering to fix your roof following a major storm? Don’t fall for it! These folks, known as ‘storm chasers,’ are all about taking your money and bolting town before finishing the job. As a local business that’s been around for decades, Sands Roofing and Construction doesn’t engage in these shady practices. In fact, we even have hail and wind damage experts on staff, as well as licensed insurance adjusters to be certain your claim is properly handled. In terms of prices, we strive to keep costs down without sacrificing the overall quality of our work. By using Xactimate, you can see the most accurate estimate. We tell those concerned with the price that, in the roofing world, you get what you pay for. Would you rather invest in a high-quality, durable roof now or pay a lower price for a roof that will need to be replaced again in the near future? Along with our expertise in residential roofing, we also specialize in commercial roofing. We realize that a new roof for your building is a major investment, which is why our professionals use only the most trusted brands. Take your pick from GAF, Certainteed, and IKO. Feel confident knowing that we offer a one-year craftsmanship guarantee. Is your roof showing signs of hail damage, leaks, shrinking shingles, or sagging along the ridgeline? Can you spot mildew, cracked/worn shingles, or trees on the roof? Are there unsightly missing or discolored shingles? If you nodded to any of the following, it may be time to get started exploring a new roof. Locally owned and operated, Sands Roofing and Construction strives for 100 percent customer satisfaction. Locally owned and operated, we offer hand nailing, tear-off and new construction, and high-quality work that’s done efficiently. Should you have any questions regarding our licensing, experience, or supplies, we are more than happy to have a conversation. We’ll even go a step further and provide a list of references upon request. Don’t make the mistake of hiring a subpar roofing contractor. From roof repair to roof installation, we have you covered. Call now for a free assessment and see what makes us the area’s roofing experts.